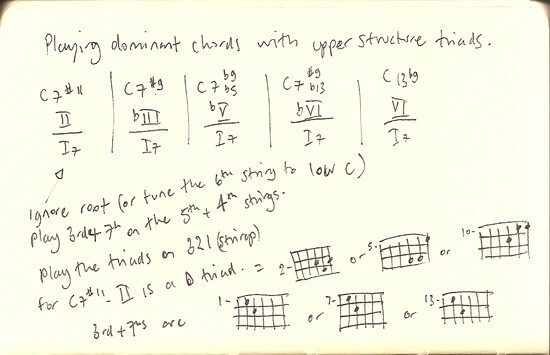 Three part chords is what we have here. Part 2. The third and seventh. As these are all dominant chords we need the 3 and b7, so that’s E and Bb. These are played on the 5th and 4th strings, so there’s only a couple of places to play them. Part 3. An upper structure triad. They’re major triads on the top three strings. Mixing all that together gives us a way of playing dominant chords. If you play the piano it’s very simple: left hand plays 3rd and 7th, right hand plays a major triad. On the guitar you might have to twist your fingers around for some of the shapes. And if you know some voicings that don’t have the root at the bottom, you’ll be in the top 0.005% of guitarists who do that. And the bass player will like you.